“a Lamp to my feet. a Light for my path.” – Luke 11:9-10 | A LAMP TO MY FEET. A LIGHT FOR MY PATH. believing that He is listening. is ultimately for our own good and for the good of those we love. – even if the result may be different to the one we would have hoped for. Behind that door, that we are encouraged knock on, is the One who loves like nobody else loves. He welcomes all who knock at His door. He will always open in response and He will more than gladly ask us in. It is then up to us to accept His invitation…or not. 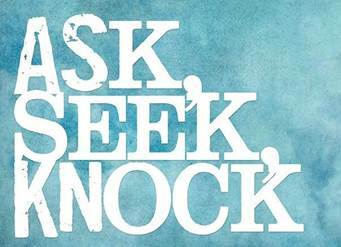 I ask…I seek…and I knock at Your door, Lord. and fill me with confident hope of a glorious salvation. Take me into Your arms, O Lord, and heal me and change me.